In this day and age time is precious and the hectic pace of day-to-day life can make providing healthy family meals difficult. Thankfully, there are steps you can take to help the family enjoy nutritious and wholesome meals every day of the week. So what can you do to ensure optimum nutrition and health with a minimum of fuss and bother? Well, you need a plan. A healthy meal plan is how to avoid the temptation to turn to unhealthy fast food or microwave meals. Following a plan is the best way to ensure you provide healthy family meals everyone will enjoy. Let’s discuss a few ideas to accomplish this. This article, “Simple Healthy Eating Guidelines,” will also give you tips on healthy food choices for your consideration. The best way to approach preparation of healthy family meals is to plan each meal ahead of time. This is less time consuming than many people think. When you plan healthy family meals ahead of time, a week in advance, for example, you will have a shopping list ready to go. Purchase the ingredients you will need prior to cooking and you won’t be running out to the grocery store several times a week. Additionally, many of the components for a healthy meal can be prepared beforehand and frozen to make it that much easier when the time comes. Breakfast has long been recognized as one of the most important meals of the day. This is especially true when there are children in the family. Children who skip breakfast usually will find the opportunity to binge on snacks later in the day. Breakfast should contain protein rich ingredients such as eggs or yogurt. Lean meats such as turkey bacon are also a great idea. Whole grain crackers with low fat cream cheese are great for kids and adults alike. Smoothies are also a great way to get a healthy energy boost in addition to the fiber they provide. You can spice up the breakfast experience by making your own burritos. Take a whole grain tortilla; add eggs, chopped tomatoes, a little cheese, and even your favorite breakfast meat. This will add a bit of excitement to a healthy breakfast menu. And it’s a lot healthier than an Egg McMuffin on the run. The same applies when it comes to lunch. A great healthy lunch should have fiber and whole grains. It should also contain protein, healthy fat, veggies, and fruit for a natural sugar treat. Again, when you’re planning your meals in advance, you’ll know exactly what you intend to feed your family. And you’ll know what you need to accomplish this. Then it’s time for dinner. It’s important sit down to dinner together as a family, not on the run with everybody going in different directions. Dinner can be more elaborate than breakfast or lunch. This makes it perfectly acceptable to mix and match store bought items with homemade. Just make sure that the choices remain healthy. It’s also important to note research shows that portion sizes are extremely important. No matter what some fast food restaurants would have consumers believe, ‘supersizing’ is not normal, nor is it healthy in the long run. A great way to save time is to purchase a slow cooker. You can start the process in the morning. By the time everyone is ready to sit down at the table, the meal will be ready to serve. On those days when things don’t go right (and they do happen) you can buy a rotisserie chicken at the store. Add some fresh veggies and other healthy sides. This can mean the difference between a rushed meal and one where all members of the family can simply relax. Including all of the components required for a healthy, nutritious meal is not difficult. It does, however, take a commitment to provide your family with healthy meals, especially for the kids. Not only are you feeding them well, you are teaching them healthy eating habits they will adopt for the rest of their lives. 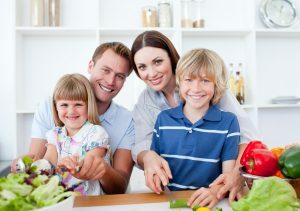 Preparing healthy family meals do not need to add stress to your day. With some planning and the correct choice of ingredients each and every meal can be both healthy and fun.